Called "the world's reigning male chorus," by the New Yorker magazine, and named Ensemble of the Year by Musical America in 2008, Chanticleer will perform more than 100 concerts in 2010-11, the GRAMMY Award-winning ensemble's 33rd Season. Praised by the San Francisco Chronicle for their "tonal luxuriance and crisply etched clarity," Chanticleer will tour to Canada and 22 of the United States, including appearances at Walt Disney Concert Hall in Los Angeles, New York's Metropolitan Museum of Art and the National American Choral Directors Association Conference in Chicago. In early 2010, Chanticleer gave 14 concerts in 11 European countries, appearing at many of Europe's legendary concert halls. Audition Policy - Chanticleer offers full-time, salaried positions (starting high $30s) with benefits. Displaying 1-36 of 36 items. This album takes a look back at Chanticleer's favorite composers and works. It combines pieces from Renaissance and Baroque composers (Lassus, Byrd, Morley, Palestrina etc.) with 20th American works composed or arranged by Stucky, Bates, Gershwin (Summertime) and members of Chanticleer. It wouldn't be Christmas without Chanticleer, and this year you can enjoy it beside your own virtual fire. This is not your average Christmas Yule Log. This Yule Log showcases one of the world's leading ensembles performing the pure sounds of music from long ago. Chanticleer's hauntingly beautiful singing captures the true essence and spirit of Christmas past. So forget all that canned Log music, go for the real thing and feel the warmth of your virtual fire throughout the radiant sounds of Grammy award winning Chanticleer. Fireside with Chanticleer features hauntingly beautiful music from their best selling recording Our Heart's Joy. Joseph Jennings' rich a cappella arrangement of the traditional spiritual, 'Steal Away,' is an enjoyable treat for both the singers and the audience. Winner of the 2003 Chanticleer Student Choral Compositition Competition, 'She Walks in Beauty,' for advanced choirs, sets the Lord Byron text in a lush harmonic style. Composer Joseph Twish sets a deeply moving homophonic work with 'Wandering,' exploring the text "God has mercy on me. Wand'ring, wand'ring.' That piece was also a previous winner of the composition competition. 'Galbally Farmer' works well with advanced Jr High, High School or moderate adult choirs, another audience favorite! Set to a 9th Century Japanese poem, in 'Voices of Autumn, composer Jackson Hill uses traditional musical stylistic devices from the same culture to create a seamless, tranquil unaccompanied choral work. Chanticleer's beloved Christmas tradition is now available in this collection of printed music, featuring a foreword by Tom Brokaw. Edited by Chanticleer Music Director Joseph Jennings and Chanticleer tenor Matthew Oltman. Includes extensive notes and pronunciation guide. Probably Chanticleer's most popular arrangement, Franz Biebl's 'Ave Maria' is challenging but is sure to become a favorite among your singers. We have included all three available voicings for you to chose from. Also included in this package is Joseph Jenning's 'Christmas Spiritual Medley.' This fun piece is rich with tight harmony and a few solos, guaranteed to please your audience. American composer William Hawley's music has been heard in London, Tokyo, Paris, the Netherlands, Berlin, Darmstadt, Munich, Los Angeles, San Francisco, Seattle, Minneapolis, and other cities in the United States, Europe, and Asia, as well as in the concert halls of New York City. Here is your opportunity to make his Chanticleer-performed compositions part of your repertoire. The ten part voicing in 'Io Son La Primavera' gives this piece an amazing depth and flair. Hawley's arrangement of Torquato Tasso's text, 'Dolcissimi Colori' is sweet and beautiful, perfect for a moderately advanced choir. Both 'Io V'amo Sol Perche Voi Siete Bella' and 'Ore, Fermate Volo' is fairly challenging yet beautiful, great examples of the Chanticleer charm! Two other composition based on text by Tasso, 'Vita De La Mia Vita' is sure to be a crowd pleaser, the setting of 'Siepe, Chegli Orti Vaghi' is beautiful and romantic - another fine example of Hawley's great style. One of our all-time favorite groups since their founding in San Francisco in 1978, 12-man professional a cappella vocal ensemble Chanticleer has gained an international reputation, performing over 100 concerts a year around the world. But they have been most sought after at Christmas. In its extensive discography, which includes several Grammy winners, Chanticleer's Christmas recordings are best-sellers. To us, "A Chanticleer Christmas is a particular treat because it was recorded live at Stanford University's magnificent Memorial Church. The soaring, glorious harmonies (including some of the purest and cleanest male soprano leads we've heard) are simply stunning. The 15-tune songlist includes classical music like Handl's "O Admirabile Commercium," Giovanni Nanino's "Hodie Nobis Caelorum Rex" and Michael Praetorius' "En! Natus Est Emanuel/Psallite;" traditional carols such as "Caroling, Caroling/Bright, Bright the Holly Berries," "Angels We Have Heard on High," "Un Flambeau, Jeannette Isabella," "Away in a Manger," "O Holy Night" and "The First Nowell;" and goodies such as Peter Warlock''s "Bethlehem Down" the Plainsong "Hodie Christus Natus Est" and Robert Young's "There is No Rose of Such Virtue." A powerful, joyous collection by Chanticleer, who are clearly in their element, and we, well, we are fortunate enough to be listening to them do their wondrous thing! With its seamless blend of twelve male voices, ranging from countertenor to bass, the San Francisco-based ensemble Chanticleer, celebrates the life of their founder Louis I. Botto on the 10th anniversary of his death. Five composers create a mass that evolves organically, as if written by one hand and the ensemble brings it to life. Using Gregorian Chant as a foundation this Mass evolves organically, as if written by one hand. These composers bring international prestige to the project as well as vastly different life paths and points of view. Israeli-born composer Shulamit Ran wrote the Credo to the Hebrew text "Ani Ma'amin." Well-known television composer Douglas Cuomo contributed the Kyrie. Turkish-American Kamran Ince composed the Gloria section in to a sufi text, while Ivan Moody, drawing from the Greek Orthodox tradition, delivered the Sanctus. The Irish folk and medieval music-influenced composer Michael McGlynn (Anuna) composed the Agnus Dei. To seamlessly travel from one composer to the next, Chanticleer offers haunting and beautiful pieces by Gesualdo, Part, Binchois, and Gabrieli. This carefully assembled collection represents the vision, artistry, and remarkable scope of the Grammy Award-winning Chanticleer has demonstrated over the course of a history that began in 1978 and has encompassed some 30 recordings. In a collection that features three never before recored, but often requested Chanticleer interpretations of Mahler's Ich bin der Welt abhanden gekommen, Gershwin's Summertime and Crouch's Lullaby, The Best of Chanticleer reveals one of the most distinctive, stirring, and indeed important voices in music today. The sun, the moon, the stars and the planets, the universe beyond them - composers have always been fascinated by their seductive power. Our newest explorations will be from Berkeley-based Composer-DJ Mason Bates in a world premiere about transmissions from outer space and "Cells Planets" by Erica Lloyd of Little Grey Girlfriend in a new arrangement especially for Chanticleer. Fantastic early works by Monteverdi, Marenzio and Palestrina and romantic works by Schumann ("An die Sterne") and Mahler ("Ich bin der welt") will join music of 20th century composers Britten, Mechem, Hopkins ("Past Life Melodies") Gershwin and others. Come with us - out of this world! "Christmas with Chanticleer featuring Special Guest Dawn Upshaw," is the first holiday album from the celebrated 12-man a cappella vocal ensemble since "Sing We Christmas," which has been a bestseller since its release in 1995. The CD Includes songs and carols drawn from many lands and traditions - from the traditional English "Coventry Carol" to a modern work by Sir John Tavener, from a Spanish carol to an American spiritual - "Christmas with" showcases Chanticleer's musical diversity. Several works feature arrangements by the group's music director, Joseph Jennings. Philip Wilder, one of the group's countertenors, said of Upshaw: "She blended so perfectly, it felt as if we'd been singing together for 20 years...suddenly she would soar above us and the sound was just magical!" Chanticleer, a twelve voice male ensemble based in the San Francisco Bay Area, has through its own success, furthered the modern classical repetoire by comissioning new compositions from a variety of highly respected sources. Chen Yi, Bernard Rands and Steven Stucky are just a few of the distinguished composers whose eminently scholarly credentials grace this collection, loosely conceptualized around the theme of love. As may be construed by the twentieth century time frame from which these pieces emerged, some of them, while not thoroughly dissonant, are atonal. Others, such as Taverner's "Village Wedding," are somber mood sketches. Cristobal de Morales is usually mentioned along with Francisco Guerrero and Tomas Luis de Victoria as the trio of Spanish composers who typified 16th-century Spanish church polyphony. The Missa Mille regretz is based on the famous chanson of the same name by Josquin des Prez, and proved to be a favorite work of Charles V. This recording conveys the deep spiritual feeling behind these liturgical settings - another bull's-eye for this splendid ensemble. Who better than Chanticleer to interpret the chants of Josquin De Prez and Alexander Agricola, two High Rennaissance composers who, though not Italian born, came to prominence while in service of the Italian nobility and papacy. De Prez, the more famous of the two, served to advance the development of both homophonic and polyphonic textures and was prescient in his use of both. Agricola also utilized the motet and various liturgical forms as was standard at the time. The exhaustive liner notes that complement this recording provide formal analysis and historical background. The sound? While the nuances of each composition may be appreciated fully by those with a dedicated propensity, anyone can be calmed by the ethereal voices and elegant organum of these simple settings. Known for their moving interpretations, spiritual insight and outstanding musicianship, Chanticleer has released several top-selling Christmas recordings . . . but none like this! This spectacular Christmas record is packed with holiday favorites with the additional treat of a couple of commissioned Gene Puerling arrangements. Clare Fischer and Bill Finegan also deliver upbeat arrangements for this lively holiday CD that is sure to be a family favorite for years. Most songs are a cappella with just a couple of tracks having full orchestra and swing band selections. This is a wonderful Christmas recording and is highly recommended. The story of love is inexhaustible. Let us into your heart to share the enchanting and disturbing emotion which has evoked more poetry and music than any other. Music by Whitacre, Paulus, Tavener, de Vivanco, Victoria, Ellington and more. This CD is a live concert recording of Chanticleer's 2011/12 Season opening concert, Love Story. It was recorded in front of a live audience on September 16 & 21 at the San Francisco Conservatory of Music. The now Grammy-winning, San Francisco-based Chanticleer was originally devoted to the Renaissance vocal repertory; their focus has broadened since to include other genres as well as commissioned works. "Magnificat," however, featuring settings by de Victoria, Palestrina, Monteverdi and Taverner (as well as the less ubiquitous Russian Orthodox Vasily Titov), returns to liturgical chant. These twelve male voices, under the musical direction of Joseph Jennings and performing arrangements encompassing the full vocal range, bring a seemingly effortless grandeur to these homages to the Blessed Virgin. This tapestry of sound is a gentle whisper of comfort and reprieve. In the Baroque era (about 1700-1750) Mexico City was unrivaled in splendor and sophistication, where chapel masters in Mexican cathedrals were composing concerted vocal music of extraordinary beauty and elegance. Two names stand out: Manuel de Zumaya and Ignacio de Jerusalem. Chanticleer selected two of the most significant Mexican composers active in the first half of the eighteenth century and, in performances of outstanding quality, show that they are not merely pale imitations of their European counterparts, but have something original to say and the craftsmanship with which to say it. Both composers are very well served indeed by this fine recording, which we unreservedly recommend as a breath of fresh air to anyone with the slightest interest in the baroque and just as much to those who consider the baroque of little interest. William Byrd and his teacher, Thomas Tallis, were inarguably the greatest composers of Elizabethan England. The primary vehicle for royally-sanctioned musicians of the court was liturgical, and in the court of Elizabeth that would mean settings for Anglican services. However, Byrd was a committed Catholic who nonetheless wrote these masses, motets and antiphons for published volumes titled "Gradualia," volumes I and II. This insurgent act apparently went uncensured, and it is these a cappella works that Chanticleer has recorded here. Given that they would not be performed publicly in a church setting by a large choir, the arrangements are intimate. They are each in the same mode and clef, which therefore creates a mood unbroken, a continuity of feeling that is quietly moving. Gregorian chant is the archetypical song for the Roman Catholic Church. There are three separate distinct periods, all of which are represented on this recording. The first era, called Gregorian, was roughly 700-850 AD. This is the time of Pope Gregory's school which rigidly codified the music allowed to be sung in churches, and the beginning of the written score for transmission to posterity rather than relying on strictly oral traditions. The Carolingian period is considered from 850-1,000 AD and began to add new styles to the more rigid structure. The medieval period was from 1,000-1,300 AD the styles proliferated immensely. That led the way to modification into secular song. In understanding Gregorian chant, the meaning of one word is particularly important. Melisma means that a number of notes are sung over the duration of a single syllable. The most joyous of the music which Chanticleer performs on this disc is very melismatic. Enjoy! "Our American Journey" is, incredibly, legendary group Chanticleer's 25th CD, and it celebrates the music of America, from sacred motets by 17th century Mexican composers to shape-note hymns to newly-commissioned works on American themes. It is a showcase of the rich traditions and also of the creative tension between unity and diversity that are inherent in American music and in American life. Chanticleer's Music Director Joseph Jennings, who adapted and arranged a number of the works, said, "(The CD) captures the essence of what we do when we're on the road, and how we want to present ourselves." Some favorites: "Guide Me, O Thou Great Jehovah," "Wayfarin' Stranger," Stephen Foster's "Jeannie with the Light Brown Hair" and "Camptown Races," "Jefferson," "David's Lamentation," "Willow Weep for Me," and the commissioned works "Whispers" and "The Un-covered Wagon." Excellent! For many years the Chanticleer Christmas concerts were a San Francisco special treat and they performed sold out performances virtually every day from Thanksgiving to New Years. And then they started winning Grammys and the word soon spread. Now they perform year round and tour all over the world but Christmas has always been special to this very talented ensemble. Here is a release of their favorite Christmas carols with wonderful a cappella arrangements by some of the best including Joe Jennings, David Willcocks and Gene Puerling. Comprising a mix of old and new, ecclesiastic and pastoral, familiar and undiscovered, this CD is a rich array. Biebl's "Ave Maria" is a contemporary setting, the final "Amen" resolved in a series of step-wise imitative phrases. Britten's "A Hymn To The Virgin" is a simple and consonant arrangement with a stark and melancholy beauty. The merry and lively ""Il Est Ne Le Divin Enfant" is arranged by Rutter, while a medley of Christmas spirituals is a satisfying blend of Chanticleer's trained vocal style, with the non-diatonic contradiction of the blues. The final track: "Silent Night," capturing all the magic of the season, as simple and unique as a perfect snowflake. Newly remastered in 2004. A self-described "Chanticleer portrait," containing a variety of different styles (a cappella), all performed with the flawless technique for which the group is admired. "O Clap Your Hands" employs eight parts in a broad polyphonic convergence. Gabrieli's "Magnificat," from the sixteenth century, divides twelve voices into three four-part choirs. "Charm Me Asleep" is a recent work, written for the group; despite it's title, it is as disquieting as soothing. Three "tone poems" (an example of program music, where the music seeks to represent a specific text) by Richard Strauss follow, then Berlin's "Blue Skies"; the latter a swinging version adapted from the Dorsey arrangement that demands attention with dramatic fortissimo ending, and a middle break that detours into a brief classical medley, very reminiscent of the Swingle Singers! Chanticleer also gets down on "Straight Street" with an authentic gospel testimonial. In celebration of its 25th anniversary as "an orchestra of voices," the 12 talented men who are San Francisco-based Chanticleer bring us this marvelous retrospective sampling from its rich discography of recordings. In 1978, Louis Botto, a graduate student in medieval and Renaissance music, wanted to hear the music he was studying performed live (a rarity at the time), and gathered a group of singers from the SF Symphony Chorus and Grace Cathedral Choir. They chose the name "Chanticleer" from the clear-singing rooster from Chaucer's "Canterbury Tales." The early years were difficult, but the group's reputation grew enough by 1991 to make all 12 members full-time employees. There are 19 gems from some of the many Chanticleer CDs that grace our catalog, and it's hard to pick favorites. Those who favor their flawless singing accompanied, we would recommend Ignacio de Jerusalem's "Hymn: Quem Terra Pontus Sidera," "Recessional: Angelicas Milicias" by Manuel de Sumaya, and Mercer & Arlen's "Blues in the Night." For a cappella, we like the Gregorian chant "Ave Maria," Tomas Luis de Victoria's "Alma Redemptoris Mater," Bernard Rands' "This Heart That Flutters Near My Heart," Chen Yi's "Wild Grass," Stephen Foster's "Jeanie with the Light Brown Hair" (arr. by Gene Puerling), Michael McGlynn's "Dulaman," "Spanish Carol," "Wade in the Water"--frankly, we could list them all! A well-chosen "best of" of one of our favorite choral groups. Highly recommended! The Bay Area's acclaimed 12-man vocal ensemble celebrates the release of their 27th recording, collaborating with the dynamic instrument ensemble Capriccio Stravagante, directed by Skip Sempe. Henry Purcell (1659-95), son of a Royal musician, wrote beautiful, expressive church music, from the ecstatic to the sublime. Eight songs, from a lovely 8-minute opening cut, "Rejoice in the Lord alway" and the jubilant "I was glad," written for James II's coronation, to the short, deeply moving "Hear My Prayer, O Lord" and the 16-minute final cut, "My heart is inditing," Purcell's grandest composition for the church. The perfect accompaniment of Capriccio fits perfectly with Chanticleer's flawless singing. "Evening" is inspirational and pleasing on many levels. Beautiful, extensive liner notes. Recorded at the Paterskirche in Kempen, Germany, in 1994, the all-male Chanticleer ensemble (featuring five countertenors), brings the consummate musicality and professionalism to this recording that we associate with any Chanticleer production. "Sing We Christmas" emphasizes classical pieces, not the typical holiday carols; rather, Charles Ives, Gustav Holst and Herbert Howells represent the twentieth century, while Handl, Victoria, Praetorius and Bach offer "Hodie Christus Natus Est," "O Magnum Mysterium" and "In Dulci Iubilo," the latter a German dance song with four separate settings (it was common practice for composers to adapt a popular song, rather than write their own) from the Renaissance and early Baroque periods. Grammy-winning Chanticleer are one of the finest male a cappella ensembles performing today! This all studio release was recorded at the acclaimed Skywalker Sound at Lucasfilm and combines the great voices of Chanticleer with top notch mixing and mastering to create an album of sonic perfection. Songs by the likes of Peter Gabriel, Freddie Mercury, June Carter Cash and Dave Brubeck with arrangements by some of the best in the business such as Peter Eldridge, Michael McGlynn and Darmon Meader are given the Chanticleer treatment with stunning results. You will love this album! "Sound in Spirit" is a totally new direction for this Bay Area-based 12-man group, in that it is the first Chanticleer recording to be conceived as a total experience-there is no silence or space between tracks. Ideally it should be listened to without pause. It is the first to add outdoor ambient sounds and to incorporate "overtone singing." The music extends from ancient sacred chants to music composed at the recording sessions themselves; all as seen through the creative eyes of composer/arranger Joseph Jennings and Chanticleer, his "Orchestra of Voices." There are 14 "cuts," beginning with Jan Gilbert's "Incantation" (from NightChants), and ending with Gilbert's "Grace to You" (from NightChants). In between are Nectarie Viahul's "Axion Estin," Jennings' title tune and "Night Spirit Song," Carlos Rivera's "Motet for 12 Singers," the Jennings-arranged "Beata" plainsong, de Victoria's "O Sacrum Convivium," Gilbert's "NightChant," Jackson Hill's "In Winter's Keeping," Giacinto Scelsi's "Gloria in Excelsis Deo," Sarah Hopkins' "Past Life Memories," Patricia Van Ness' "Cor Meum Est Templum Sacrum" and others. "Sound" is a surprising, moving, eclectic piece that takes us to places of meditation, wonder and mystery. A beautiful, very special CD from Chanticleer that needs to be listened to again and again to be fully appreciated. John Tavener's 2000 composition, "Lamentations and Praises," a liturgical drama scored for male voices "singing in the Orthodox Byzantine style," flute, bass trombone, string quartet and a number of eclectic percussion instruments such as tubular bells, a Byzantine monastery bell, and very large Tibetan temple bowl. This is a profoundly religious work on the crucifixion, death and resurrection of Christ, written for the 12 voices of acclaimed Chanticleer, the only full-time classical vocal ensemble in the US. The beautiful and extensive liner notes take us through the 13 sections, or ikons, and explain in English what the singers are saying and what it means. Deeply meditative and beautiful! The seductive and irresistible songs of the sirens - sometimes fateful, sometimes fatal - fill Chanticleer's 35th anniversary opener. Renowned Chinese composer Chen Yi sounds the call in her own inimitable language, and celebrated Irish composer Michael McGlynn channels the undeniable connection of Ireland and the sea that surrounds it. Other works by Bates, Gabrieli, Palestrina, Gesualdo, and more. The recording features Vince Peterson's arrangement of Temptation, written by Tom Waits. The sequel to Chanticleer's best-selling and critically acclaimed Mexican Baroque recording, with more recently discovered choral masterpieces by Mexico City Cathedral's chapel master, Ignacio de Jerusalem. This recording brings to life one of the most monumental and elaborate choral works of the New World. Chanticleer is joined by Chanticleer Sinfonia, conducted by Joseph Jennings. Director Joseph Jennings arranged most of the songs on this recording. Chanticleer apply their magnificent voices to the African-American sacred music tradition of spirituals, jubilees, hymns and chants. The idea of a concert style performance of these songs was pioneered at the end of the Civil War by the Fisk Jubilee Singers.Because of the exacting concert standard which Chanticleer applies the music, their performance is very much in that tradition. Under Mr. Jennings direction the group sings very familiar tunes, "Old Time Religion," "Deep River," "All Night, All Day" (you have to hear the soaring soprano on this one! ), "Good News" and "Steal Away" to name just a smattering. We also like the voluminous notes which Mr. Jennings writes to accompany the music, for his point of view and information are illuminating. A collection of works showcasing modern American composers-many of whom are relative unknowns - "Poet's Eye" is refined, luxurious, even abstract, and, as the name implies, also serves to expose a variety of poets as well. Many of the compositions were commissioned specifically for Chanticleer, and they most definitely reflect a modern sensibility. "Dusk," by Allen Shearer, connotes the movement of the earth and sky, imbued with tranquility and friction in equal measure. "Mushrooms," is a tumble of mournful declarations. Hawley's "Seven Madrigals" (two of which are included here) are modern madrigals, weaving strands of the classical with contemporary inflections. Rorem, using the Whitman's Civil War diary "Specimen Days" as his source, offers a minimalist reduction, sometimes monophonic, consistently somber and disturbing. A CD of depth and power. Whatever the thematic material, Chanticleer's approach is the most erudite; indeed, their analysis of each song's history and composition meets the highest critical standard. It is this absolute musical integrity that then informs the quality of the performance. On "Wondrous Love," a cache of international folk songs, sung a cappella, is the basis for this meticulous study. Folk songs, by definition, are "for the people"; Chanticleer maintains this focus while also seizing the opportunity to enrich the original arrangements with new complexity and depth, as heard on "Arirang," a Korean song utilizing the pentatonic scale with elements of western harmony, or "La Petenera," which begins with a soloist and then gradually incorporates twelve voices into an ever-expanding confluence of countermelody. A Robert Shaw/Alice Parker arrangement graces the fifteenth-century French tune, "L'Amour De Moy." Difficult, but exquisite, available in three voicings. This one is for mixed chorus (SATB Trio/SATB). Difficulty Level: Advanced Adult. Duration - 00:06:10. A rousing rendition of this traditional Jewish folksong, this setting won the 2014 Chanticleer Student Composer Competition. It's message of peace is perfect for community, festival or honor choir concerts. Difficulty Level: Medium Advanced Adult. Comissioned in 20012 by Chanticleer. 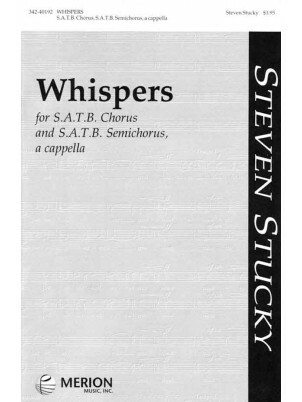 Whispers was conceived as a companion piece to Steven Stucky's 1979 composition Drop, Drop, Slow Tears, a work that Chanticleer sings beautifully.